The straw poll began in 1979 and has been held every summer before a contested presidential caucus. 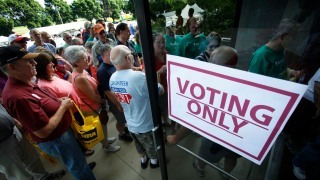 Republicans head in to cast their ballots in the 2011 Iowa Republican Party's Straw Poll. Republican leaders in Iowa have agreed to end the state's straw poll because of waning interest from presidential hopefuls and questions about its relevancy. Iowa GOP Chairman Jeff Kauffman says state party officials voted during a Friday morning conference call to end the straw poll, which began in 1979 and has been held every summer before a contested presidential caucus. For years, the poll has been considered an early but unreliable test of campaigns' strength. Critics say it has become a costly sideshow, and many candidates fear the humiliation of a poor showing. Some 2016 GOP hopefuls recently said they would skip the event altogether.